Liturgy for the whole church p140 and p142 Elijah passes his mantle (Bock) A dramatic reading for three readers and a skit for two people with a narrator based on this reading. BUC Song Project In Spirit we rise (Anderson) It would be great to sing this song about God's spirit working in and through us. Sorry, this isn't available yet online or in a songbook. TiS 711 / ATOK 334 / Iona (M&G) / WoV681 / VU383 / SFFS 2124 / GtG283 / G(II)330 / StF038 Come O Holy Spirit / Wa Wa Wa Emimimo (Nigeria) This song is just fun. And very easy. Try to sing it in its original language (Yoruba), it sounds a bit inane in English and it’s not hard!! Encourage your congregation to dance a simple side-to-side step to this; they will enjoy it even more. If we can’t go a little crazy on Pentecost, what hope is there for us, really? A good song to help us remember that our faith is global, and to think of the church and all people in Africa. Sound sample (Thanks Thom!) Good for kids. TiS 419 / NCH270 / CH592 / A&M252 / UMH544 / VU205 / WoV685 / ELW403 / HPP222 / GtG285 / PH314 / CP635 / CP(E) 185 / W&R327 / SP92 / 82Hml-513 / StF389 Like the murmur of the dove's song (Daw) Excellent words and a simple tune about Christian unity. Each verse ends with "Come holy spirit, come". Lyrics and organ sample. TiS 409 / AHB 322 / CH595 / UMH543 / VU202 / StJ / SLW43 / W&R328 / Cha250 / StF391 / MP488 O Breath of life come sweeping through us (Elizabeth Porter Head) This is a really good older style hymn with inclusive lyrics. Lyrics and sound sample. Not all verses are in all hymnals. Unusual Source: Blow through me Breath of God (Miriam Therese Winter) This chant is very beautiful. It takes a few listens for the congregation to pick it up, or you could ask the musicians to play it as a prayer for the congregation. "Like a pipe, like a flute, like a reed making melody". It can be found in "Songlines, Hymns, Songs, Rounds and Refrains for Prayer and Praise, Crossroad, New York, 1996" or "Womantalk Woman Prayer" (1987). We have not sung this for some years so it will need to be retaught at BUC. *Taizé / MV075 / StS079 / SFFS 2118 / GtG284 / GC(II)479 / G(3)547 / SP99 / URW395 Holy Spirit Come to Us / Veni sancte spiritus / Tui amoris (Berthier) Gobsmackingly beautiful if you have a cantor, but it works well if you don't, too. Sheet music, translations, sound samples. CH589 / A&M240 Come Holy Spirit / Breath of Heaven (Bell) A lovely simple repetitive song. Includes verses like "Come , Word of Mercy" and "Come to disturb us"…. *GA183 Come Holy Spirit the spirit of Wisdom (Willcock) Good song. It's in 7/8 so you can't go wrong. The words are also excellent about God-with-us and the coming of the Spirit This is also in New Song in an Ancient Land Vol 1 (in the Liturgy Library at BUC). *ATAR643 Fire of prophet cool wisdom of sage / Spirit lead us (Somerville) An excellent song about knowing God through sacred stories, and being part of God's sacred story. This would be an excellent song for the entry of scriptures at the start of the service if this is your practice. It may be best sung first by a soloist. You could use it repeatedly during the Pentecost season. *VU791 God bend your ear and hear my prayer (Honore) A lovely simple and intuitive chant with an inclusive, responsive reading of this Psalm. Highly recommended. *Online Resource Our Song in the Night (BiFrost Arts) Not a congregational song. You could use the recording, or get your musicians to play this quiet lovely song. Sound sample, lyrics, purchasing options. *Iona (LFB) / Lau930 Listen Lord (Iona / Bell) Beautiful chant-like chorus, can be used on its own or as a response, or used with the verses. Good to use for the intercessions. *PfAS077B In complete desperation / I refused to be comforted easily (John Bell) Amazing lyrics (not entirely inclusive) which would speak well to many contemporary congregations. A simple tune. Highly recommended. Sheet music sample (incomplete). Taizé / TiS 739 / AoV2-041 / ATOK 404 / VU290 / GA269 / SFFS 2054 / GtG820 / G(II)451 / GC639 / GC(II)626 / G(3)733 / CP568 / W&R421 / URW388 / Lau947 Nothing Can Trouble / Nada te turbe (Berthier) Excellent and quite well known Taizé chant. Spanish lyrics are not too hard for non-Spanish speakers. Sheet music, sound samples, lyrics and translations. Good for kids. CH570 / UMH512 / W&R495 / Cha629 / ZSS164 When the storms of life are raging (stand by me) (Tindley) A good gospel song. Hymnals have a range of translations. Great for kids. Sound sample and lyrics. PfAS077D By your strength you have redeemed your people (Walter Pelz) A nice simple Psalm refrain. *MV123 Day after day night afer night (Bauman / Good) A lovely simple chant or Psalm refrain. Good for kids. UMH438 / VU416 / A&M476 / CP467 / CP(E) 430 / W&R718 / StF550 / Lau861 / MP159 Forth in thy name O Lord I go (Wesley) Timeless words about committing all our works to God. I like this hymn best played lightly and joyfully with a simple drum beat as a kind of minstrel tune, rather than a hymn. The old fashioned words seem to make a lot more sense to me that way. Some hymnals (including TiS) have sensitively modernised the words. Here's an older version with the slow organ. Yeah, the slow organ is nice too, I suppose, but I really like it about twice that speed... Oldy-but-a-goody. 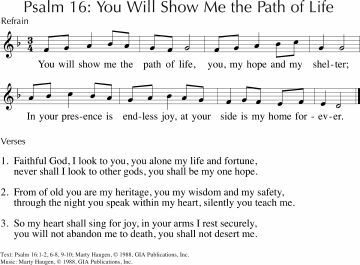 *PfAS016D My heart is glad (Beckstrand) I really like the words and tune to this Psalm refrain. It will need to be sung through a couple of times before reading the Psalm. *CH656 / VU477 / PH507 / CP060 / A&M448 / GtG515 / CP(E) 305 / W&R706 / Cha420 / SP217 / URW120 I come with joy a child of God (Wren) A good and jubilant communion hymn. Lyrics and a very slow tune sample here. *AoVK-12 God is our shelter truly a friend indeed (O'Hara) Groovy little round / more like a call and response really. Good for kids. 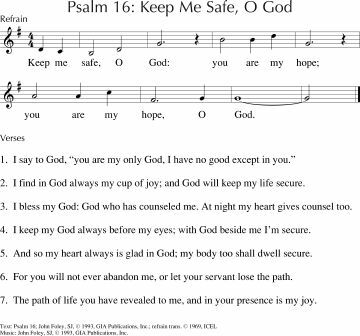 StJ / G(II)22 / GC23 / GC(II)18 / G(3)029 / Lau40b Keep Me Safe O God (Foley) Simple cantor and response "Keep me safe O God. You are my hope, you are my hope, O God". Lyrics and sample sheet music. Sound sample. G(II)23 / GC24 / GC(II)19 / G(3)030 / URW235 You Will Show Me the Path of Life (Haugen) Simple cantor and response "You will show me the path of life, you my hope and my shelter, in your presence is endless joy and your sight is my hope forever". Lyrics and sample sheet music. Sound sample. Freedom and persistence. Works of the Flesh vs. Fruits of the Spirit. Triumph of the Spirit; being good neighbours. *Iona (M&G, T1AU) / MV099 / GC(II)673 / G(3)763 / Lau996 Stand O Stand Firm (Cameroon) I love having an excuse to sing this simple and powerful song; didn't Elijah have to be pretty brave? Very easy for your congregation. You can make up cantor parts too “Oh my sisters…. Oh my brothers… Oh my children….” or you can name countries you are praying for in your intercessions. Good for kids. Scottish sound sample. Lead sheet. TiS 613 / AHB 546 / ATOK 405 / CH166 / LBW469 / ELW765 / A&M713 / SFFS2197 / HPP265 / GtG683 / GC578 / GC(II)560 / G(3)663 / CP506 / CP(E) 507 / W&R469 / URW179 / 82Hml-482 / Lau969 / StF526 / MP882 Lord of all hopefulness Lord of all joy (Struther) Excellent straightforward Irish tune (SLANE), and beautiful words. Would be a good choice for the final song. Oldy-but-a-goody. CH611 Holy Spirit fill our hearts (Unknown) A lovely simple song. Good to teach to kids in Sunday School perhaps. Good for kids. GtB God is love and love is giving (Langmead) A simple kids' song about God's love. A round. We have sung this a bit. It would be good to repeat it. Good for kids. NCH401 / GtG308 / W&R388 O god in whom all life begins (Daw) Excellent words of living as a community of faith. Sung to a simple English melody. AA123 / VU361 Small things count (Murray / Bray) Good simple morality song for kids. Easy to sing. Good for kids. Fresh Sounds 53 But the fruit of the spirit is love, joy and peace (Unknown) This is a simple chorus I still remember from Holiday Club at the Lutheran church in the next town when I was in Primary School. It's probably from Scripture in Song, but I don't know. I'd love to know if anyone knows where I can track it down - not that you'd need the sheet music, really. ATA 184 Spring follows winter (love is the law) (Mann) Lovely words to a familiar traditional English (?) melody. Mostly inclusive. It's not easy to follow Christ; you can't put it off. CH195 / StS053 / AA061 Here to the house of God we come (Murray / Gibson) Good honest words and a simple, but unusual tune. TiS 686 / ATE 292 Lord Jesus we belong to you / Because we bear your name (Robin Mann) Lyrics (loads a pdf). TiS 561 / AHB 467 / NCH494 / CH535 / LBW498 / A&M823 / CP(E) 621 / 82Hml-684 / Lau862 / MP224 Who would true valor see / valour see (Bunyan) A lovely old hymn, with old-world imagery. I think it still works OK. TiS and NCH have inclusive language throughout. CH and CP(E) do not have inclusive language, even for humanity. I really like the tune MONK'S GATE. Particularly nice with light instrumentation. A violin / flute and a bodhran may be all you need for this. Inclusive lyrics (loads a Word document). Oldy-but-a-goody. TiS 687 God gives us a future (Smith) Great words to a very easy hymn tune. Careful not to let it get the tune get too pompous; the words are not! "God gives us a future, daring us to go into dreams and dangers on a path unknown. We will face tomorrow in the Spirit's power, we will let God change us for new life starts now!". Lyrics here (scroll down). Notice how the hymn has been split into to two parts to include the blessing and words of mission. Iona (T1AU) / MV110 / StS037 First born of Mary provocative preacher (Bell) A short, energetic song about the nature of Christ's life on earth; the phrase "Itinerant preacher" resonates well with this passage. *ATAR643 Fire of prophet cool wisdom of sage / Spirit lead us (Somerville) An excellent song about knowing God through sacred stories, and being part of God's sacred story. This would be an excellent song for the entry of scriptures at the start of the service if this is your practice. It may be best sung first by a soloist. You could use it repeatedly during the Pentecost season - particularly appropriate this week if you are also having the reading of Elijah. Do you have some ideas? I'd love to hear about songs you would sing - add a note in the comments! A really old one, Breathe on Me, Breath of God. NCH 292, Cha254, LBW488 - Mostly inclusive, even in old hymnals. For Kings:,Christ Has no Body Now But Yours, MV 171and Gather 3rd edition.